Denny Hamlin, Joey Logano (who was fastest in each of the first two rounds of knockout qualifying), Kurt Busch and Kasey Kahne earned the fifth through eighth spots on the grid, as all of the top eight qualifiers are former Bristol winners. “We need to be able to go out and win races,” Kenseth said. 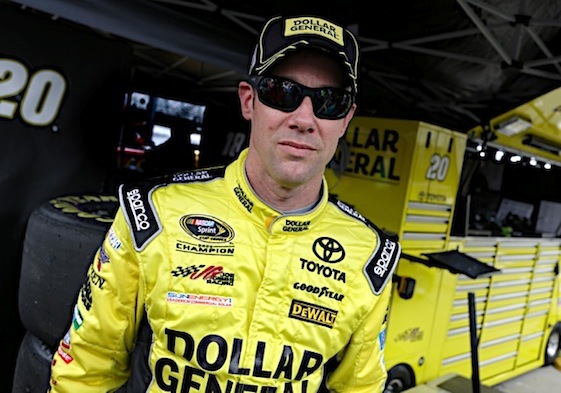 “Last year and so far this year haven’t been particularly great for JGR. I think we’ve had two wins that weren’t plate races in the last year and a half as a company. Jimmie Johnson, last week’s winner at Texas Motor Speedway, didn’t survive the first elimination in qualifying and will start 28th in Sunday’s race. In fact, Kahne was the only Hendrick Motorsports driver to advance to the final round inFriday’s time trials. (20) Matt Kenseth, Toyota, 128.632 mph. (2) Brad Keselowski, Ford, 128.442 mph. (19) Carl Edwards, Toyota, 128.322 mph. (4) Kevin Harvick, Chevrolet, 128.211 mph. (11) Denny Hamlin, Toyota, 127.419 mph. (22) Joey Logano, Ford, 127.317 mph. (41) Kurt Busch, Chevrolet, 126.871 mph. (5) Kasey Kahne, Chevrolet, 126.829 mph. (27) Paul Menard, Chevrolet, 126.829 mph. (1) Jamie McMurray, Chevrolet, 126.612 mph. (18) David Ragan, Toyota, 126.436 mph. (3) Austin Dillon, Chevrolet, 126.262 mph. (88) Dale Earnhardt Jr., Chevrolet, 127.081 mph. (42) Kyle Larson, Chevrolet, 127.073 mph. (51) Justin Allgaier, Chevrolet, 126.562 mph. (78) Martin Truex Jr., Chevrolet, 126.503 mph. (40) Landon Cassill(i), Chevrolet, 126.428 mph. (31) Ryan Newman, Chevrolet, 126.088 mph. (95) Michael McDowell, Ford, 125.947 mph. (47) AJ Allmendinger, Chevrolet, 125.939 mph. (14) Tony Stewart, Chevrolet, 125.831 mph. (83) Matt DiBenedetto, Toyota, 125.798 mph. (24) Jeff Gordon, Chevrolet, 125.609 mph. (55) Brett Moffitt #, Toyota, 125.199 mph. (17) Ricky Stenhouse Jr., Ford, 126.378 mph. (10) Danica Patrick, Chevrolet, 126.328 mph. (13) Casey Mears, Chevrolet, 126.303 mph. (48) Jimmie Johnson, Chevrolet, 126.146 mph. (23) JJ Yeley(i), Toyota, 126.046 mph. (43) Aric Almirola, Ford, 125.823 mph. (6) Trevor Bayne, Ford, 125.798 mph. (38) David Gilliland, Ford, 125.625 mph. (16) Greg Biffle, Ford, 125.551 mph. (26) Jeb Burton #, Toyota, 125.510 mph. (98) Josh Wise, Ford, 125.453 mph. (46) Michael Annett, Chevrolet, 125.158 mph. (62) Brendan Gaughan(i), Chevrolet, 124.034 mph. (30) Ron Hornaday Jr., Chevrolet, 123.682 mph.